is that they’re pretty darn stubborn. The thing about dentistry flooring design ideas is that they’re pretty darn stubborn. It doesn’t matter how much thought a person puts into piecing together the perfect new look for their business, there’s always at least one hidden blip in the plan that seems to exist just to mess everything up. This dental staff understands that all too well. In the early hours of a warm summer morning, not long before they were to open their doors for the day, they gathered together in the waiting room over a new design magazine that they had purchased for their clients’ perusal. You know how it goes, one thing led to another and soon enough they happened upon a gorgeous floor (provided by some company named Everlast Epoxy – perhaps you’ve heard of them) with beautiful coloring and a perfectly shaped logo right in the center, shining like a beacon of good business. They were smitten. No – more than smitten, they were determined to bring that same attractiveness to their own waiting room. Two weekends later, driven by the optimistic belief that nothing would go wrong, they set about taking a hands-on approach using paint, brushes, stencils, and a whole lot of gumption to add their logo to their existing vinyl flooring. In theory it was a very nice thought. In practice, however, it turned out not to be their best idea, ranking in the bottom three along with the drill-themed ring tones and bimonthly Clown Fridays. At the end of the day, all their dentistry floors had to show for their effort was a gaping mouth with lopsided teeth and an unfortunate sneer, neither of which lent a whole lot of confidence to their claim of crafting perfect, even smiles. 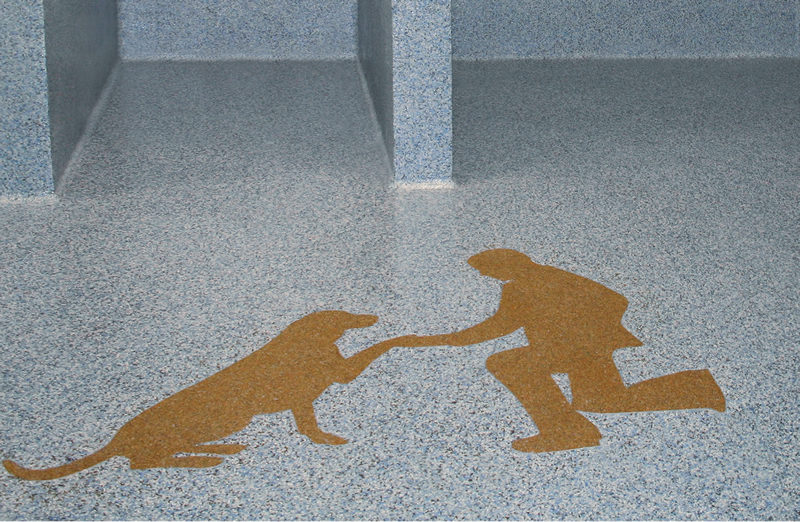 To find out how to create a logo for your dentistry epoxy flooring the proper way so that it will fit nicely into your “Perfect Smile” theme, call us at (800) 708-9870.